POPA FCU keeps it simple by offering one type of (share draft) Checking account – a minimum deposit of $50.00 is required during opening and there is no minimum average daily balance requirement. This is a FREE Checking account with access to Online Banking, Mobile Banking and Bill Pay services. Let us give you a second chance with our “Second Chance” Checking Account. If you don’t qualify for a regular checking account, due to a negative “ChexSystems” rating or simply from mismanaging a checking account in the past, here’s your opportunity for a second chance. There is a minimum monthly maintenance fee of $5.00 and the minimum deposit to open your Second Chance Checking Account is $50.00. If there are no non-sufficient funds or negative balance activity for (12) months, the Second Chance Checking Account may be converted to a Regular Checking Account at the member’s request. Please see POPA FCU’s Truth and Savings and/or call the credit union for additional details. NOW AVAILABLE for the very first time, a Bulldogs Checking Account for K-9 $avers who are 14-17 years old. It is a full-service, FREE* Checking account, with a custom Bulldogs MasterCard® debit card to give teens the financial freedom while giving parents peace-of-mind. A parent or legal guardian must be a joint owner on both accounts – K-9 $avers and Bulldogs Checking. *Free=No account maintenance fees, no per transaction fees, no check fees. Punitive fees still applies; please see POPA’s Schedule of Fees for details. Bounce Protection is a discretionary overdraft service requiring no action on your part that provides you a safety net up to an automatically assigned overdraft limit. Your Bounce Protection limit may be available for checks and other transactions made using your checking account number or automatic bill payment and recurring debit card payment. Also, at your request, we may authorize and pay ATM transfer or withdrawals and everyday debit card purchases using your limit. The best way to avoid overdrafts and fees is to keep track of your account balance by entering all checks, debit card purchases and ATM withdrawals in your check register, reconcile your check book regularly and manage your finances responsibly. We offer an online financial education tutorial (print PDF also available) – Checking Navigator – to help you manage your checking account in order to avoid overdraft fees. However, if a mistake occurs, POPA Federal Credit Union offers additional ways to cover overdrafts in addition to Bounce Protection. †Your Bounce Protection limit may be available to approve overdrafts for checks, automatic bill payments, recurring debit card payments and other transactions using your checking account number. At your request, we may authorize and pay ATM and everyday debit card transactions using your limit. If an overdraft is approved, you may be assessed our Courtesy Pay Fee of $25.00 for each item. All negative balances must be brought positive within 30 calendar days. POPA Federal Credit Union reserves the right not to pay if the account is not kept in “good standing.” Bulldogs and Second Chance Checking Accounts are not eligible for Bounce Protection. Please contact a Member Service Representative at 562.229.9181 for more details. ‡This information is effective as of December, 2014 and is provided as examples. Please ask us about our current specific products, rates and fees. APR=Annual Percentage Rate. Don’t Pay to Bank. 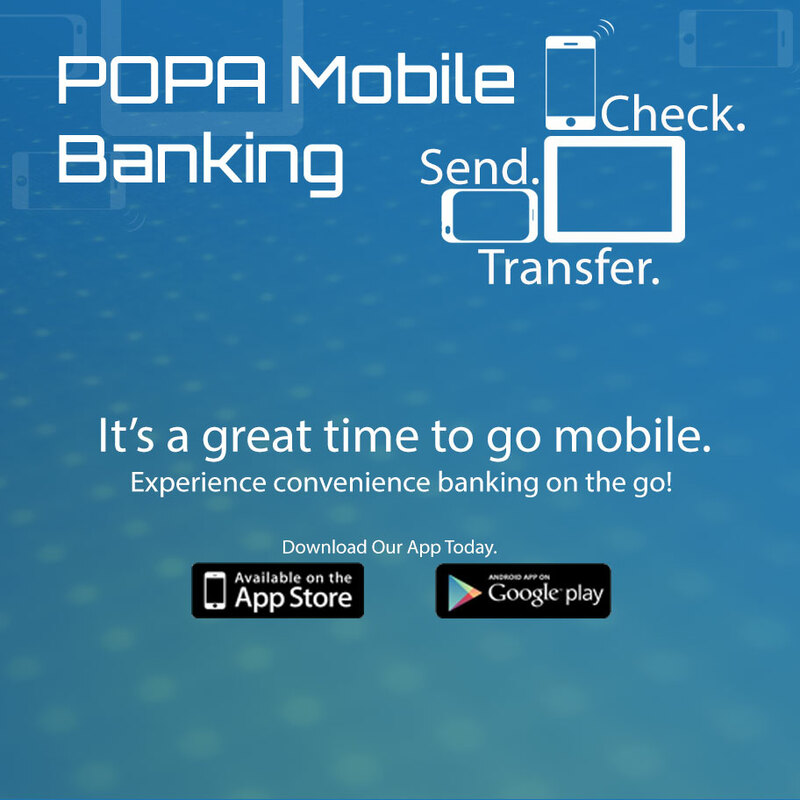 Open a POPA Checking Account Today! Complete the Membership Application/Account Agreement. Mail or bring into the POPA office nearest you! Get the full effect of experiencing our convenient and value-added products/services with Direct Deposit. Find an ATM or Shared Branch near YOU! Overseas With Your POPA Debit Card?